Now most people who follow my car adventures know I absolutely love the DB series already but when CEO of Aston Martin, Dr Andy Palmer unveiled the luxury British brand’s stunning new Lagonda super saloon, it was breathtaking and left me stunned. I think I would have taken a hundred selfies if I wasn’t gaping so much. 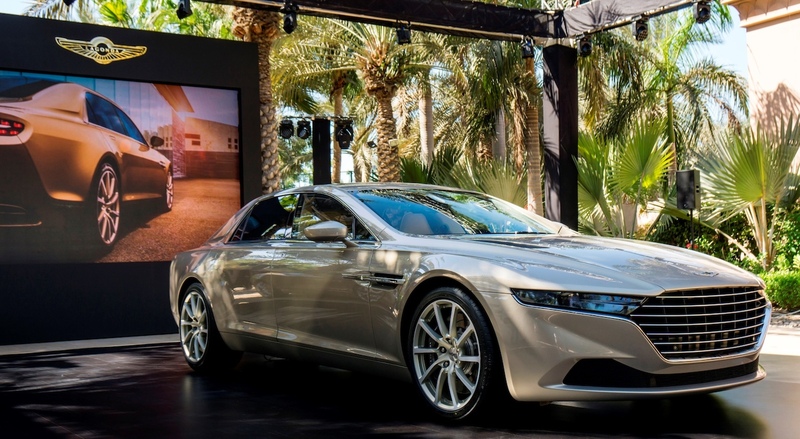 The Lagonda, built in a strictly limited small series initially only for customers in the Middle East, will be known as the Lagonda Taraf in this market. The return of Lagonda follows in the wake of other headline-grabbing projects by Aston Martin in recent years such as the creation of the One-77 hypercar, V12 Zagato and last year’s CC100 Speedster Concept. Like most super brands, This is hand-built by the finest craftsmen and women at Aston Martin’s manufacturing facilities in Gaydon, Warwickshire, in a dedicated building previously given over to the creation of the One-77 hypercar. The new super saloon is being offered for sale by invitation only with precise pricing details remaining confidential….I’m inclined to scrub up, dorn my high heels and head to their showroom pretending to be a buyer – wish they didn’t know me as a petrol head luxury journalist but I guess with some large shades I can pull off a diva infused personality.